In response to the invitation of H.H. 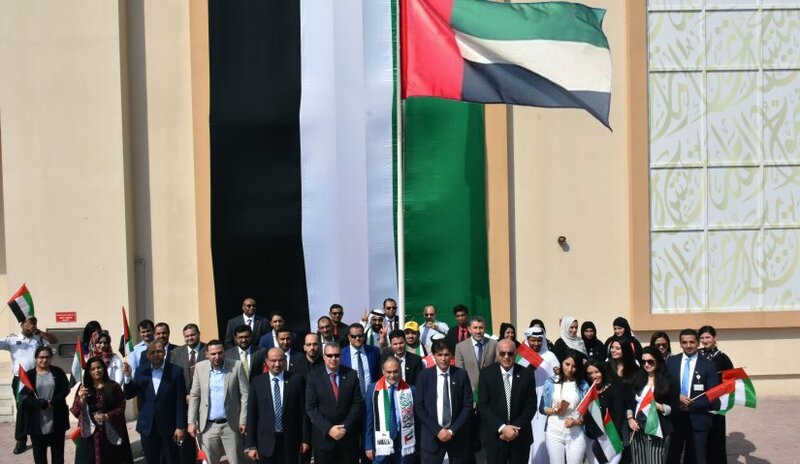 Sheikh Mohammed bin Rashid Al Maktoum, Vice-President and Prime Minister of the UAE and Ruler of Dubai, to celebrate UAE Flag Day today, the Deanship of Student Affairs at Al Falah University invited faculty members, administrative staff and students to commemorate the anniversary of H.H. Sheikh Khalifa bin Zayed Al Nahyan becoming UAE’s President in 2004. AFU President Dr. Abdelhafid Belarbi, Vice President for Academic Affairs, Dr. Sameer Barghouthi headed the celebration. Prof. Nasr Abbas said on the occasion "Flag Day is an affirmation of true loyalty and belonging to UAE." Faculty members, staff and students expressed their appreciation for H.H. Sheikh Mohammed bin Rashid Al Maktoum, Vice President and Prime Minister of the UAE and Ruler of Dubai’s initiative to promote loyalty and patriotism among the people.